He was born in Le Havre, into a large family. His elder brother was the well-known painter Raoul Dufy, who became Jean’s mentor throughout his career. In 1920 Jean Dufy settled in the artist quarter of Montmartre, next door to Georges Braque. Braque, a friend of his brother Raoul Dufy, encouraged him to experiment with the Cubist style. He also spent time there with Picasso, Apollinaire, and Derain, among others. After settling in Montmartre, Dufy participated in many exhibitions, which reflected the music and art of Parisian culture after the war. Dufy created colourful paintings of circuses and clowns, as well as Parisian street scenes, the gates of Paris, the Eiffel Tower, the bridges of the Seine. This painting shows us one of Jean Dufy's favorite themes of horse riders painted in boisterous colours. 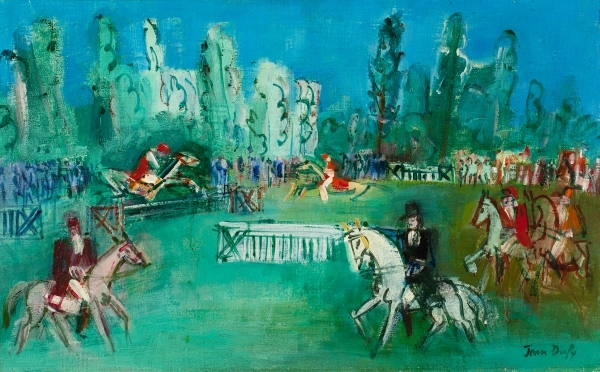 Charles Melman wrote in Jean Dufy’s catalogue raisonné de l’oeuvre ,volume II, about Dufy's horses: "The white horse appears in many canvases, which in no doubt explains his frequent and surprising use of this colour. For him, it is likely the symbol of a god of power, of the movement and flight that animates the scenes as a whole. 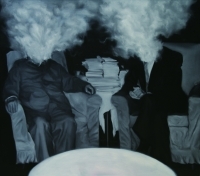 No train, car or plane appears in these paintings, but we do see carriages and their riders. There is little that is mechanical in his work; the animal is exalted above all things, tamed, but poised for flight."